I was introduced to Indiahikes when some of my friends took a Himalayan trek through it. While browsing their site got interested about a winter camp and immediately finalized on trying it out. 6 of us , 3 each from bangalore and chennai grouped up together. 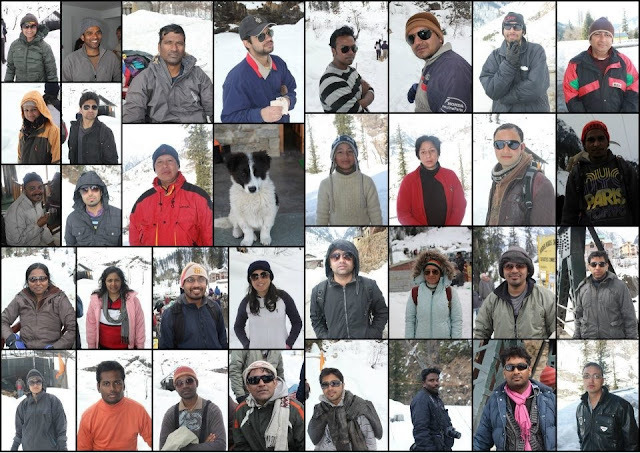 Plan was to take flights to and from Delhi and take overnight bus travel to/from manali. We reached manali at around 8 AM and it didnt look like a important tourist destination in India.Main town was filthy.We had to get ready by 12 PM and need to find a place to rest till then and refresh ourself. Took a hotel room near the busstand for 4 hours (Rs500).Only one person was able to take bath in hot water. Others had to be satisfied with freezing water. Temperature should be be < 5 degree Celsius . Every thing in the room , right from blankets to wooden chairs were chill. Called up Aarthi for reporting and she asked us to come to a junction from where cab will take us to camp site. Started around 12 PM that day. The camp site was at Kothi . It was on the way to Rohtang pass . All through the road there were shops which were closed or had very thin attendance .Could infer that tourist inflow was very minimal at this point of the year. Once out of manali commercial town ,view was beautiful. Both sides of the road and even the road in some places were covered with blankets of snow.Its a first time i am encountering snow of this magnitude. We were even worried if we could cope up with it. Aarthi mentioned that it was one of the coldest winters in recent times.Learnt that till 2 days back the road was closed for traffic and the previous batch of wintercamp was canceled due to bad weather.Feeling lucky :). After 20 mins of drive we reached a spot in kothi till which jeep can ferry us. From there camp site was 1.5 KM or so in walk.But the catch is that its uphill walk in fresh snow with all the luggage.Since we were all set from the hotel it was easy to proceed. After around 20-30 mins of walk through snow covered landscape we reached the campsite. During this walk the surrounding view changed from being beautiful to being mesmerising.This is the paradise where we will stay for the next seven days. On arrival we were given a 'warm' welcome. Yes hot tea awaited us.For the next 6-7 days hot tea became part of our staple diet. We were shown the dormitory.It was neat and arranged well. Since we arrived ahead of others , we picked the beds of our choice .There was a tandoor which we learnt was used to burn wood to keep the room warm.We picked the beds around the tandoor. After a long journey by bus on the previous night and after a stressing walk in a cold weather natural tendency was to hit the beds for a nap. Slowly people trickled one by one and we mutual introduction happened. Associating names to faces was diffucult for atleast 24 hours. It was almost evening when everyone has settled down. That evening we had a short walk in snow to get used to the climate and get to know the method of walking in snow. Snow was around 2-3 feets high on average.First person leading in front has to make the way. Its bit of a hard job. He had to press the snow hardly so that other can walk easily on that path. It was for around 30 minutes in one direction and it become dark on returning. Food was simple , fresh & hot and we simply loved it. I didnt hear anyone complaining about the food. Next day we had a half day trek up hill.Sun was bright and climate was clear. We had a nice walk.Up hill trek should have taken around 1.5-2 hours . It was a slow walk interleaved by sufficient stops to rest and have fun.While comming down we had even more fun as we slided down steep slopes. Unfortunately Hari lost his point and shoot camera during one of the long slides. We couldnt get a clue of where it would have dropped and where to search.Down hill was hardly 30 mins and we were back at camp site for a late lunch. After resting for couple of hours we had to check the array of shoes and slides and pick the one which suit us more. We picked and labelled them.That day over dinner had a introduction of each of participants. Though many were form IT ,it was good mix with doctors , businessman , voice over artist etc. By this time all the people in our dormitory had got mingled well. Myself , Dinesh , Hari , Arun , Manoj , Nazir , Adithi , Deepu , Sandeep , Jihar . Cinema was the most important theme but was not limited only to that.I still remember few sms read out by Adithi and Deepu. We also spend much of time playing cards inspire of chilling weather driving us to bed .Learnt few new card games too. Next day we started skyiing training right infront of the cottage . 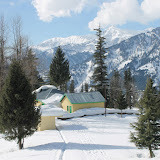 This place was geographically well placed for training but was bit small for 20+ people training simultaneously.One of my friend who had been to this camp in previous years had mentioned that then they had to carry their boots and skis to another place and train there .Luckily we were saved from the extra time to be spent in travelling. First day at skiing was filled with innumerous 'fall-downs' , 'cleaning the shoes for snow' & 're-fit of skis' .I was too time consuming that i tried more hard not to loose balance alteast to avoid this process.Towards the end of first day i could get balance. Next couple of days conditioned improved and at the final day of training i could manage without falling even for one time.But i couldn't master the turning on both direction as few did. I could do turning only in one direction confidently. Last day at the camp we had a day long trek to solang valley.There were two options there. Either stay there and take adventure sports or trek more to temple. We skipped adventure sports as it was bit costly being a tourist place and decided to towards the temple. It was around 2 KM from solang valley and there were hardly anyone apart from us on this stretch. I was surprised to see a family with a little kid (probably aged 2 ) also taking this path towards the temple. On reaching the temple we were served tea as prasadam :). The temple was completely covered with snow and were asked to remove our shoes for proceed to the temple. Most of us stayed back , but a more adventurous gang (4/5 people) remove the shoes ,had polythene covers over the socks and proceeded to the lingam. This trek wasn't a complete trek as for most parts we walked through habitable places apart from the stretch from the solang valley to the temple.We returned just in time for dusk but decided to halt at a place some 1 KM from the cottage, so that we could cover the last stretch in dark. It was nice experience to walk in dark .Later that day had the sendoff party with specialy sourced chicken . Next day packed stuff and left the cottage at around 10 AM after bunch of photographs and exchange of phone nos and email ids. We were dropped at manali at around 1 PM and our bus was supposed to start at 4:30.Another must see natural wonder at manali is the hot spring or sulphur springs. They are formed by volcanic activity underground and it was GOD sent one for locals to get cheap hot water. After a bit of confusion we decided to take the bath at the hot spring. Remember that we haven't taken bath at all throught the camp :). There were couple of places having hot springs. A temple near the town center had one which was publicly used. So we (10 of us) decided to go to a place where we can have hot spring bath in a hotel.It was located some 8KM from manali and we hired a tempo (charnges Rs600). Unfortuanatly on reaching the hotel , we found that there is only one bath room having hot spring and also have to wait for 1 hour (till 2:30 PM) to get it opened. Hotel charges Rs100 per person. Luckily there was also a public pool adjacent that hotel. I checked that and it was clean enough.Four of us decided to take bath here. Other six decided the wait for the hotel to open and take bath.For those of us at the public pool there was no time restriction and i almost took bath for almost 30 mins.Boarded the bus at 4:30 PM towards Delhi . We had a nice sleep , thanks to the hot water bath , that we skipped even dinner at the motel. Thanks to Indiahikes and the Hosts of this winter (Romie, Aarthi and and their son Aryan and they team ) and very enthusiastic gang which accompanied us. It was a memorable trip.